Special occasions are just that: special. There are only so many of them in a lifetime. A marriage, the birth of a child, a big anniversary (silver, gold), a retirement. Certain occasions beg for special recognition. To get married on the beach in Florida. Bliss. Celebrate your next special occasion in Florida. Are you planning a wedding? 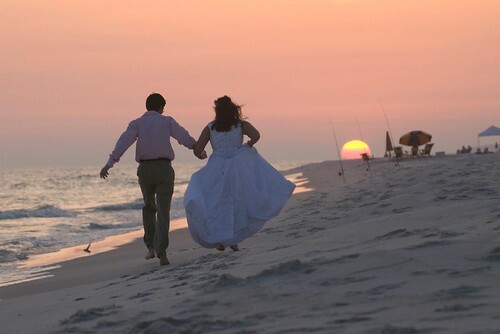 Have a destination wedding in Florida, where you can say your vows on the beach and spend your honeymoon at a Florida Bed and Breakfast, kissed by sunshine and warmth. Approaching your silver or gold anniversary? Celebrate it in Florida. Travel with just your spouse, or bring along the whole family. This is indeed cause for jubilation. Retiring? Travel to Florida with your closest business associates and their spouses. You’ve worked a long time, and you deserve something more than a party. Special occasions deserved to be recognized and celebrated in style. Bring your next special occasion to a Florida Bed and Breakfast. This entry was posted on Friday, March 23rd, 2012 at 5:44 pm	and is filed under Florida Travel. You can follow any responses to this entry through the RSS 2.0 feed. You can leave a response, or trackback from your own site.